Never Yet Melted » Why Do Conservatives Keep Losing the Culture War? 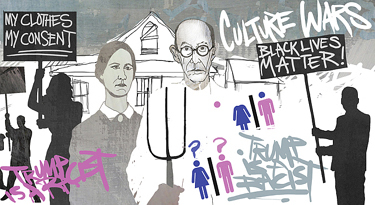 7 Feedbacks on "Why Do Conservatives Keep Losing the Culture War?" I don’t believe that these progressives are winning in the marketplace of ideas. They are winning in the high school of conformity. A woman I have known 35 plus years. Recently said “Of course, as an educator, I’m against arming teachers “. I asked why and she broke off the discussion. I was expecting to hear her reasoning. I’ve come to believe that she doesn’t have reasons, just conformity. JFM is correct. David Brooks is full of baloney. He lives and works in NYC where they think their socialist state is paradise while it’s a disaster waiting to explode. I bet Brooks doesn’t know anyone that owns a gun, hunts, or attends Sunday Church services. The left is losing. But, don’t tell them. They think they’re winning. It’s why they lose elections even when they deploy the deep state and cheat. The corporations that virtue-signaled (ending discounts merely b/c I’m an NRA member) on the NRA will lose money. NRA membership is skyrocketing. A recent poll, after the terrible shooting at Parkland, showed that only 28% think gun laws are the answer. Over 51% believe it’s mental health. Normal Americans know gun control is a hoax. JFM, You are a charitable persosn. You didn’t tell your teacher friend that from June 2016 to June 2017 far too many, seven people, were killed in school massacres, while over 60,000 died by opioid overdoses. And. no one is blaming big pharma. The previous 2 commenters remind me of H. G. Wells’ comments regarding Adolph Hitler, quoted at the beginning of an essay by Orwell on nationalism and the Left. Wells thought that AH was such an OTT fringe character that he couldn’t possibly be of any real significance. In retrospect, as Orwell noted, Wells’ complacency doesn’t look too prescient. It’s true that the Left, in what may well be its final most debased stage, has been reduced to fomenting an endless series of social hysterias. But at the same time they have taken over much of the high ground in this society, so they can carry out an effective pressure-from-above/pressure-from-below strategy. And they don’t have to have anything like a majority to do this, any more than they did in Czechoslovakia in 1948. You cannot win a war by refusing to fight. For decades, conservatives have sat back while the Left advanced culturally as aggressively as it liked. If you’re old enough to remember “Point / Counterpoint,” the old nightly-news feature that counterpoised conservative Jack Kilpatrick and liberal Shana Alexander on issues of current interest, you could see the outline of it even then: Alexander was unrestrained in her vilifications of conservatives and Kilpatrick himself. Kilpatrick barely ever even objected. That having been said, a reaction is in progress. Note the mushrooming of the indie movements in fiction, cinema, and the visual arts. (Full disclosure: I’m part of that.) Note how the eBook has eclipsed paper publication, and independently made video productions, including news broadcasts, are now commanding significant shares of television viewing time. The great majority of these things are conservative in their theses…and the Left, which has relied upon its control of gatekeeper institutions, is having a very hard time coping with them. This is a vitally important topic, that has been identified long ago, even by Ayn Rand. Yet, the progressive left continues to advance in the most critical areas. The most important front, I believe, is education: schools, from K through PhD. They have become increasing intolerant indoctrination centers. That is the front that conservatives must puncture if progress is to be made. It all revolves around the weapons you choose. Conservatives choose, logic, reason and facts. The left chooses emotion. Sadly, the culture of America is emotion. Most of us stopped at about age 10 shouting “I HATE YOU!” at our parents and others who didn’t give into our fancies. The left has not. And the country seems more inclined to say, “Now,Now, poor thing” than to send them to their rooms. What David Brooks wrote could easily have been written by Adolph Hitler in the ‘30s when talking of the Brownshirts. Distilled down to its essence, Brooks is saying that the argumentum ad baculum trumps reason.